The opening lines of the mass today are ‘Rejoice’ – which has given it the traditional Latin name of ‘Gaudete’ with the use of rose coloured vestments. The rose colour appears only for today and the other ‘Rejoice’ Sunday in mid-Advent. In both cases, there is a look forward to the great joyful feast days we prepare for. This reading might be seen as anticipating the ‘Passover’ which was at the time of Jesus’ death and resurrection and will be recalled in the Easter Vigil liturgy. Joshua was the leader chosen after the death of Moses to bring the people out of the desert into the land that had been occupied by Canaanites. In their time of wandering with much grumbling against God and Moses, the Hebrews had not kept up all the observances that mark Jewish life still to our own times. The liturgy spares us the section where all the men are circumcised, and picks up the joyous feast when they now celebrate their first Passover in their new homeland. This is marked by the end of the ‘manna’ which had been their food in the desert. From now on, they can live as occupants of their promised land. During Lent, we are may be said to journey towards the Passover which becomes for Christians the celebration of Christ’s sacrifice and resurrection. The bread made without a rising agent recalls the haste of leaving Egypt and is commemorated in the unleavened wafers we consecrate at mass. The response picks up God’s mercy, with a call to praise and to rejoice in God’s rescue. St Paul also is looking at the Easter theme, the new creation that comes with Christ’s redemption, here expressed as ‘reconciliation’. It is the one great act of Jesus redemption which brings all believers into the loving relationship with him. In turn ministers, including Paul – and potentially all of us – are entrusted with ‘handing on’ the message. Paul’s image of ‘ambassadors’ is one that fits all in ministry but again, the laity in their daily lives represent Christ as well. To bring this reconciliation about, Jesus became so identified with human sinners that Paul can say he ‘was made sin’. Christ taking on our sinfulness frees us to become what Christ is: ‘the goodness of God’. Such a glorious destiny fits well with the call to ‘rejoice’. ‘Not holding faults against’ us: The translation ‘faults’ seems a little weak, when Paul is looking at all the deep sinfulness of humanity which God is ready to forgive. There are a number of Greek and Hebrew words to express this, and various possible English choices, like ‘trespasses’ used in the Lord’s Prayer, and ‘transgressions’. The word in today’s reading is used several times by Paul, especially in Romans, to mean the breach with God’s love which comes from human wrong-doing. Its root comes from the idea of ‘falling away’. Whatever words used, it is clear that the New Testament insists that God is constantly merciful, no matter how often humans turn against God and how terribly humans treat each other. But parables are often open-ended, and have more than one application. This has been one of the most popular of all Jesus’ teachings for the way people can apply it to their own circumstances. Most see the father in the story representing God, as an example of God’s eagerness to forgive and welcome sinners. The son who’s been called ‘prodigal’ is first restive and irresponsible, wanting a more exciting life of self-indulgence. To ask for his estate is treating his father as if he were dead and his property available to the heirs. By the Law, the older brother would get a double portion, but this father has enough to give the younger a good estate. He sells out and leave home. Nothing is said here of the elder son; but clearly he and the father continue on the remaining property together. Next a lively telling of the life of the younger son in first its pleasures and then utter poverty. Since Jews were forbidden by the dietary laws to eat pork, there is a special sense of degradation in herding pigs. There is a good deal of self-seeking in the son’s repentance – he shows less desire to be with his family, but thinks he can at least find a job with them. He does recognize that he has sinned not only against his father but God and hopes he can make some amends for that, if only for his own benefit. The father sees him from a long way off, a hint that he was always looking for his return. He does not even listen to the son’s apology and never thinks of treating him as a servant, or asking for proof of change. Instead the son will be treated as the most honoured of guests. As for St Paul, the degradation of sinfulness is seen like death, and now the son is ‘restored to life’ in the eyes of his father. There is an implied call for the listeners of the story to rejoice with the household for the return of the sinner. Next Jesus turns to the older son. He seems suspicious from the start when he hears a celebration, and does not even go in to see what is happening. The father going out to him is a humble reversal of their positions, but the son does not respond to the invitation to join in the party. Instead he complains, and it is telling that he looks upon his working for his father as ‘slavery’ –he sees no joy in having lived long so closely with his father. He has obeyed but seemingly without much love. He cannot bring himself to call the younger one his brother, but distances him as ‘this son of yours’. G. B Caird, in his commentary Saint Luke, says: ‘The father refuses to be forced into taking sides with the one brother against the other; with all their shortcomings he loves them both and has never ceased to regard them as sons, though each in his own way has tried to contract out of his place in the family.’ The father reminds the older son that he shares in all the father has, but still repentance of the lost one is something both should be able to rejoice in. ‘All I have is yours’ hints at what riches Jesus longs to give his followers, as well as the assurance, ‘you are always with me’. Jesus’ by this story asks the Pharisees and the scribes to have joy with him in welcoming the sinners in need of help. The story has ended without giving us the ‘happy ending’ of the older brother relenting and rejoicing. The result is left open: will he respond? The invitation of the parable has now been made to the listening Pharisees – Jesus offers them a change of heart, but will they accept? The story is ‘left open’ to include us as well. Do I in my life fit into one of the three roles in the story? What does the merciful Father ask of me? We live with a legal system that seeks punishment, and lack of forgiveness is understood as natural for any who have been wronged. 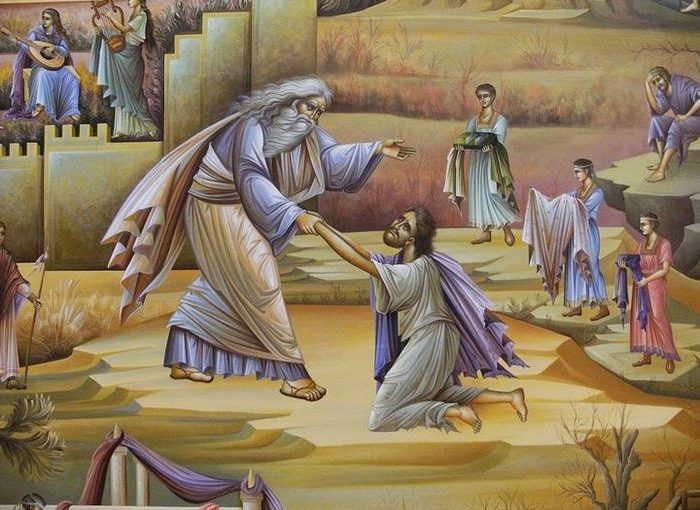 Luke quotes Jesus: ‘Be merciful as your Father is merciful.’ And that is the challenge not just for the Pharisees then but for Christians now.